Observations of asteroid 2000 DP107 provided the first images of a binary asteroid in the near-Earth population. The data show that it is composed of an ~800 meter diameter primary and a ~300 meter diameter secondary revolving around their common center of mass. J. L. Margot, M. C. Nolan, L. A. M. Benner, S. J. Ostro, R. F. Jurgens, J. D. Giorgini, M. A. Slade, and D. B. Campbell. 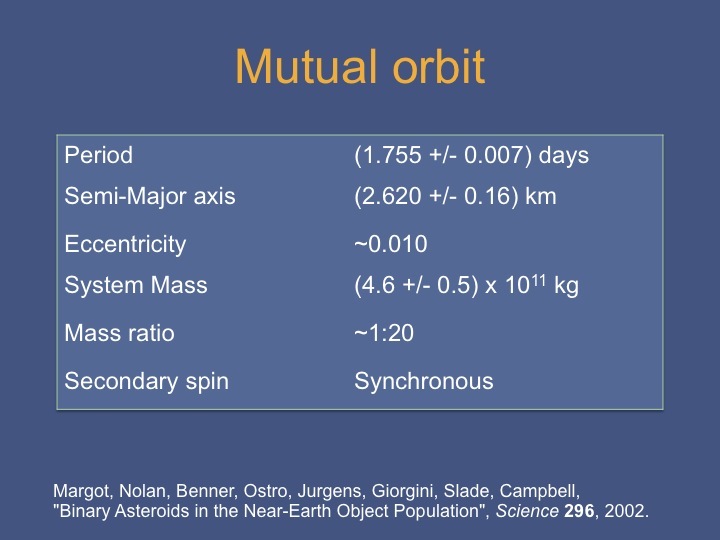 Binary Asteroids in the Near-Earth Object Population. Science 296, 1445--1448, 2002. S. P. Naidu, J. L. Margot, P. A. Taylor, M. C. Nolan, M. W. Busch, L. A. M. Benner, M. Brozovic, J. D. Giorgini, J. S. Jao, C. Magri. 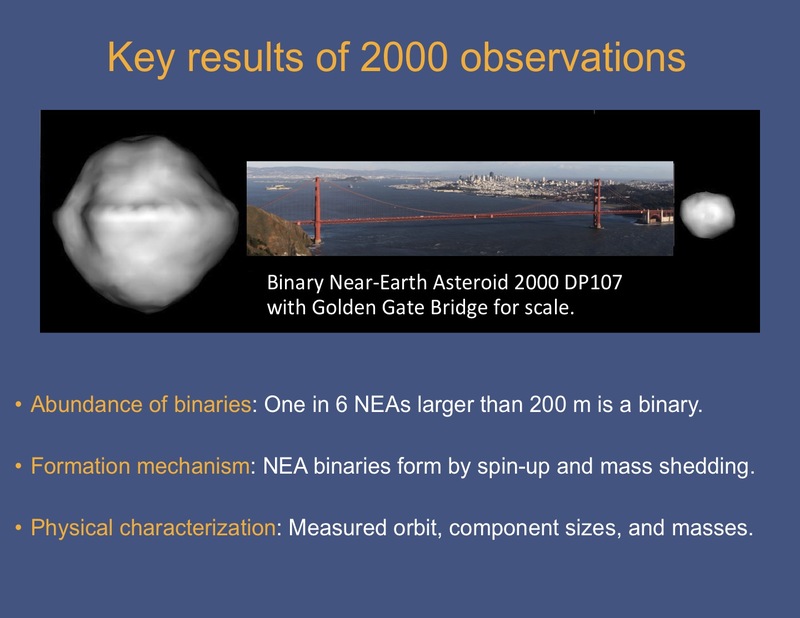 Radar Imaging and Characterization of Binary Near-Earth Asteroid (185851) 2000 DP107. Astronomical Journal, submitted. The 2000 data were of sufficient quality to derive the mutual orbit of the binary, including a measurement of the reflex motion. The asteroid made another close approach to Earth in 2008. The 2008 data are of much higher quality, enabling additional analysis, including improved shapes, volumes, masses, densities, spin states, and scattering properties of the components (Naidu et al, submitted). 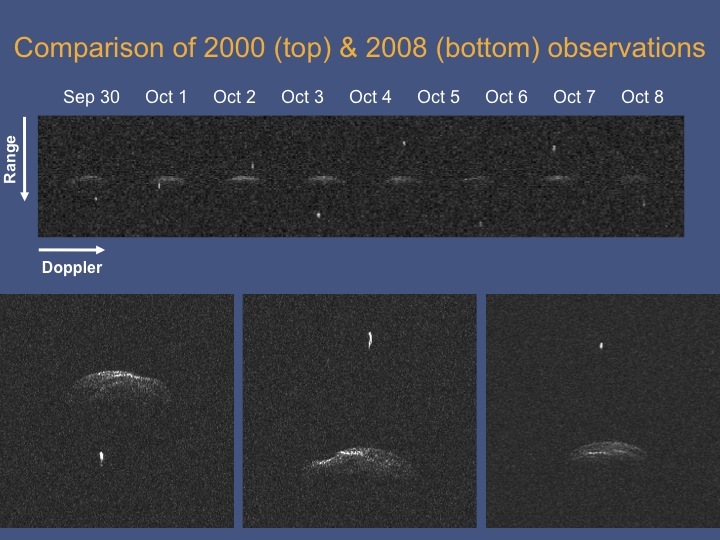 Below are some results and animations from our 2000 observations. An animation showing the orbital motion of the binary asteroid 2000 DP107 as it would be seen from an observer on Earth close to the time of closest approach on Sep 19, 2000. The animation spans the time interval between Sep 9, 2000 and Oct 9, 2000, so the binary asteroid is first seen to approach then recede. One can see the change in solar illumination as the asteroid travels along its orbit, as well as eclipses and occultations. Also, the orientation of the orbital plane varies as seen by an observer on Earth, because the animation geometry (camera view) changes due to the Earth - asteroid relative motion. Click on the image for the 1.1 MB animation. 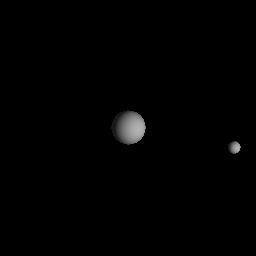 Same as before, except that the distance of the observer is now fixed to better illustrate the eclipses and occultations. Except for distance, the aspect changes due to the relative Earth - asteroid motion are included as above. An eclipse occurs when light from the Sun is obscured. 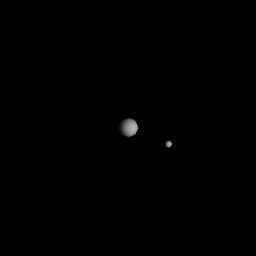 An occultation occurs when one component passes in front of the other as seen by an observer on Earth. Click on the image for the 1.4 MB animation. A total eclipse of the primary by the secondary occurs on Sep 30, 2000 near 18:50 UTC. Careful measurements made by Petr Pravec (Ondrejov Observatory, Czech Republic) at the same time showed the brightness attenuation as the secondary obscured light from the sun. Click on the image for a 50 kB animation of the eclipse.